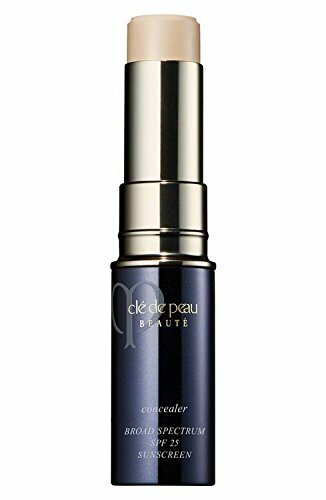 A perennial makeup-artist favorite, Clé de Peau Beauté Concealer is highly editorialized and continues to win major awards year after year. It covers spots, freckles and dark circles to create an even-toned, beautiful complexion. The creamy formula comes in a stick base, which enables it to absorb in a way fluid foundation can not for lasting, foolproof coverage. Japanese Powder Technology camouflages imperfections while brightening skin, while super bio-hyaluronic acid creates a smooth, supple complexion by maintaining skin's moisture level for healthy looking radiance. It blends on without feeling heavy, too, which allows radiance to shine through. How to use: Extend the concealer stick about 1/2-inch and apply directly to the spot you want to conceal. With your fingertips, pat lightly around the area of application to blend. Apply with a brush in short, feathery strokes around the inner corners of the eye and blend outward. Apply concealer after your liquid or fluid foundation. Apply concealer before your powder or compact foundation. Full Size 5 g / .17 oz. If you have any questions about this product by Cle De Peau, contact us by completing and submitting the form below. If you are looking for a specif part number, please include it with your message.